This excellent and finely crafted book from Reel Art Press is a retrospective of Preston’s entire career. 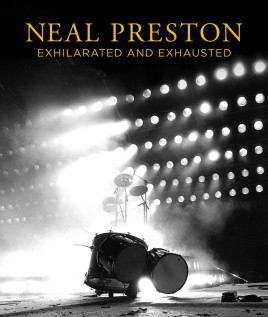 With a foreword by Neal’s best friend, esteemed screenwriter and film director Cameron Crowe, and an introduction by Preston, the elusive mood, ethos and depth of Preston’s work is set from its start. The book represents the first time that Preston has allowed full access to his vast archive, stretching back fifty years. 335 large pages of this robust collection still doesn’t cover all of the dozens of artists that Preston has photographed, often intimately. In addition to the performance images, portraits, backstage scenes, outtakes and personal moments that only someone with this kind of access could attain, thoughtful and insightful running commentary by Preston accompanies the striking images. This is a window into understanding the man behind the camera, and Preston clearly put a lot of time and effort into his choice of words. Anyone that truly understands photography knows that access and how to use it is absolutely key, and Preston was in the driver’s seat as he was the official tour photographer for many bands and artists, thereby allowing him coveted and complete access. Led Zeppelin, Queen, The Who, Bruce Springsteen and Guns ‘n’ Roses are some of the employers of Preston as their official lensman as they toured extensively. Zeppelin is the band most closely associated with Preston, and they were, of course, one of the very biggest and charismatic groups of their time. They were also the least media friendly, wanting to maintain a certain mystique. However, they and their highly intimidating and protective manager, Peter Grant, (a huge man that had been a wrestler amongst other occupations) welcomed Preston in with open arms. Preston, 65, was just the right age (as were the artists themselves) to have the maturity, natural talent and instincts, but also and very importantly the great drive and strength of youth to take on the highly demanding grind that these tours posed. The books’ title obviously reflects the thrill of capturing the images of an ambitious insider, yet at the cost of comprehensive exhaustion. Preston says “Shooting live music performances is something few photographers do really well. I just happened to discover one day that I was pretty good at it.” Indeed he is, and Preston’s images are the visual fodder of rock and roll’s most glorious times. In my view we’ll never see such an exciting and inspired confluence of forces again in real life, but within these pages we’ll never not. Grab it.